The great thing about the double loop trails at Bartholomew Winery in Sonoma is that hikers can experience five different plant communities in a three mile hike. Oak woodlands surround the winery and its picnic area. There are a few open meadows that aren’t yet filled with vineyards. Heading up the slopes, the forest becomes more dense and oaks mix with madrone and bay trees. On the upper clearings, the woodlands give way to exposed ridges of chaparral with their shrubby, thick-leaved vegetation such as manzanita and chamise. In the lower elevations of the park, Arroyo Seco and Schell Creeks run along the cool, shady lengths of trail where ferns, big leaf maples, and spicebush dominate the landscape. These cooler, moister areas support at least three dark, quiet redwood groves. As usual, my focus was on the ground looking at flowers in macro mode, and so I have mostly flower close-ups to show for my hike. California buttercups (Ranunculus californicus) were prevalent in the meadows this week. 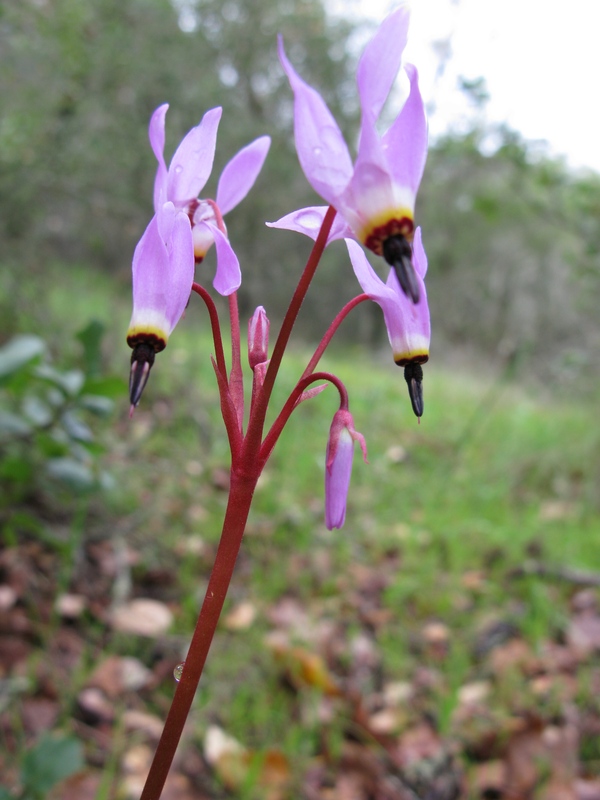 Shooting stars, also known as mosquito bills (Dodecatheon hendersonii) made their first appearance of the season. Ranging in color from dusky to hot pink, they are sometimes called inside-out flower because of their prominent fused stamens and backward flying petals. Purple sanicle (Sanicula bipinnitifida) is beginning to appear in the grasslands, along with its yellow flowered cousin from the parsley family, Sanicula crassicaulis (pictured in previous post “Blue Oak Woodland” at https://viridiplantae.com/2015/01/26/blue-oak-woodland/). Cynoglossum grande, or hound’s tongue, is a plant in the borage family just coming into bloom this week in our area. 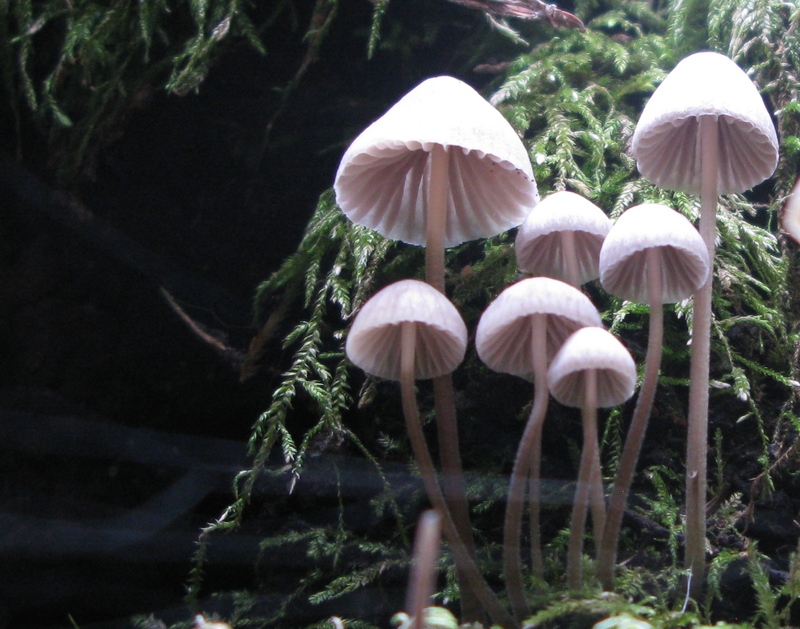 It tends to grow in the sunnier woodland areas. Its cheerful blue flowers, showy for their habitat, brighten the forest floor of oak woodlands. Myosotis latifolia, a pretty forget-me-not indigenous to northwestern Africa is a related but invasive species in coastal areas. 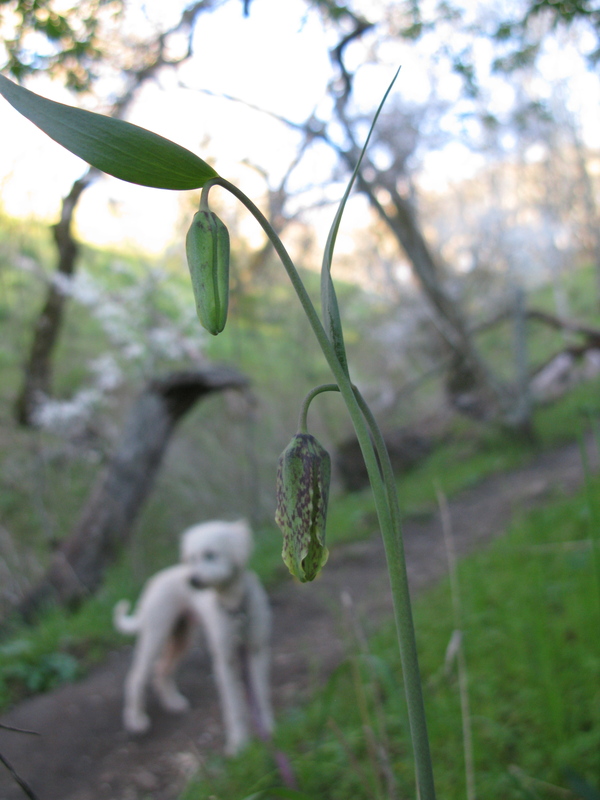 Fritillaria affinis with Canis lupus familiaris. Dogs on leash permitted! Woodland flowers that prefer more shade are just coming into bud at Bartholomew.The enchanting checker lily’s arching grace is evident even before it comes into flower. The Latin name Fritillaria affinis, in addition to distinguishing this plant from other lilies with identical common names, makes reference to the squarish seed pod which was thought at one time to resemble a dice box (Latin: fritillus). Notice the checker pattern on the lower bud. If deer or other browsers don’t chomp them, these buds should open up into beautiful nodding bell shapes in the next week or two. Below is an exposed ridge with manzanita and other shrubs that have xerophytic adaptations: thick, linear, hairy and/or gray-green leaves. Many of the shrubs have the ability to regenerate limbs from their stumps after a fire. The manzanitas have clusters of urn shaped white or pink flowers early in the season. Their twisted, shiny red-brown bark which peels and appears to blister in summer make chaparral the prime sculpture garden habitat of California.